Two interesting articles on reading showed up yesterday. I couldn't resist. The New York Times ran an article by Alexandra Alter, "Line by Line, E-Books Turn Poet-Friendly." Readers (or writers) of poetry know that poems have a structure that matters. Line breaks, spacing and placement of words matter intensely to how the poem will be read and perceived. So when the first e-books of poetry appeared a few years ago, the poet authors were taken aback to see that all formatting had been removed! According to Alter, at least one leading poet, John Ashbery requested his publisher withdraw the digital editions of his poetry books. But now, e-books have managed to deliver digital versions of poetry that retain all the original formatting. The digital versions now are equivalent to print poetry editions. Some poets remain skeptical, according to Alter's article. But Ashbery just signed an agreement to release digital editions with Open Road for $15 each. The second article yesterday was in the Wall Street Journal, by Jeanne Whalen, "Read Slowly to Benefit Your Brain and Cut Stress." Whalen reports on book clubs that are forming, not to discuss books, but to simply sit together silently and read. The article is actually a mish-mash of a bunch of different pieces of information about reading, some reported very briefly. It is possible that Whalen was severely edited. The article is frustrating because it mentions briefly a number of important points, but never fully explains them. The online article at WSJ does offer an entertaining "Test How Fast You Read" feature. The reading club Whalen first reports on, from New Zealand, calls itself the Slow Reading Club. Slow reading is a major movement that has been growing for some years world wide. There is no particular leader, but there have been several books and a number of more in-depth popular and semi-popular articles about the process. I would recommend reading "Reading Fast, Reading Slow" by Jessica Love, from The American Scholar, Spring, 2012 for a much better explanation of the movement, and the science behind it. Love is a cognitive scientist who has done some of the investigations of reading and is a science writer and blogger. 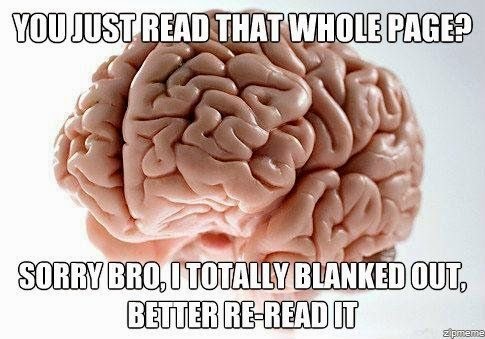 For instance, when we read, our eyes don't smoothly sweep across the lines of text. We skip across the text, stopping periodically in what scholars of reading call "fixations." At each fixation, our eyes can take in about 4 letters to the left, and 15 to the right of the fixation point, on average. The letters at the edge of that perception range are fuzzy and may simply be guessed at in terms of general shape or lower/upper case. That information will speed up the reading at the next fixation, where those peripheral letters from the right will be more central. Meanwhile, we decode about 8 of the letters in the center of the fixation. Then we hop again, which the scholars call a "saccade." Love reports that reading scholars find that readers typically spend about 10% of reading time in those hops, "saccades," during which no reading is happening. There is a lot more detail in the article about how the reader quickly (or slowly, in the case of surprises) decodes words. The article goes on to cover studies of speed-reading (mostly badly done), but a few of which are reliable to show that the faster you go, the less you recall. Slowing your reading, even because the text is illegible or missing some letters, increases retention of the content, apparently. Yoo-hoo, textbook editors! Here's an idea! Actually, can you imagine trying to read for class and have missing l_tt_rs? It w_uld dr_ve you cr_zy! One thing the Whalen article on WSJ covers that is not mentioned in the older article from Dr. Love, is the research about what happens when people read online. Love mentions that most research on reading has been done online. But she does not say anything about the patterns discovered. Whalen mentions the F pattern. When readers in English (and I think other Western languages that read left to right) read web pages, researchers have found that the readers' eye movements follow an F pattern. The eyes scan completely across the page for the first few lines, then sweep down the left side of the screen. Web developers tend to know this fact and use it when they create those left hand panels and top tabs or menu bars. Or ads. 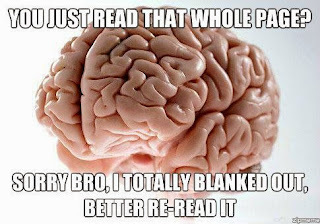 The decoration for this page is courtesy of http://weknowmemes.com/2012/08/scumbag-brain-on-reading/ (I am not sure you want to go there; I think it's not safe, but it had this nice image). I keep thinking about this research every time a child reads complex readings at my church. It takes patience to listen to the stumbling sometimes, but I keep reminding myself that we are all going to retain that reading so much better! Pollyanna!